Our highly regarded Chefs offer food every day from 12 noon to 9 pm. You can enjoy delicious meals from the extensive menu which features classic English food to suit all tastes. Our menu is created by using only the best and most fresh local West Country produce. In addition to the main menu we have a Specials Blackboard. You are also recommended to try our excellent Sunday Carvery featuring 2 choices of roasts with all the trimmings. Should you be thinking of getting the family or work mates together for a special meal, we can offer you our charming private dining room at no charge. With seating for up to 12 people you can enjoy your celebration in your own private space. Our aim is to help you make your wedding day individual to your own requirements. By arranging a visit to view our splendid facilites at first hand we can give you the personalised experience to make your special day one to remember. With a four poster bed and deluxe bathroom which includes a Jacuzzi and shower/steam cabinet. Included in the price of the room you have a choice of Champagne and luxury chocolates or a beautiful bouquet of roses and luxury chocolates. Also provided are luxurious bathrobes. Function Room - Conference Room. 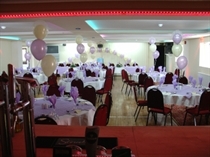 we can offer you the hire of our Function Room which has a capacity for up to 100 people. Please contact us to discuss your requirements and we will be happy to help you organise and help plan for your special occasion. We welcome everyone to the Halfway and for this reason we have created a disabled friendly suite. The bathroom has been specially adapted with a walk in bath, lower wash basin and strategically placed handrails. We welcome assistance dogs. Most of our bedrooms are on the ground floor with just one or two steps leading to the front door. There is a ramp on the side of the main building for access to the Bar and Restaurant. If you have any specific requests or questions that you would like to discuss with us please call or e-Mail. 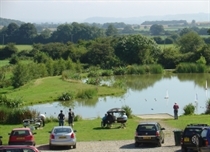 The new Fishing Lake is available for our guests to fish FREE (under 16’s must be accompanied by an adult though).